Before I start confusing some people, I’m going to get this out of the way first: this is not a review of Halo 4, but a review of Halo 4’s Limited Edition extras. In other words, I’m reviewing everything within the Halo 4 Limited Edition except the game! Anyone who is interested in Halo games have probably read more than enough reviews and blogger impressions on the game itself, but what about this limited edition? I heard not much of a peep on this package’s quality and I really could have used it before I bought it! 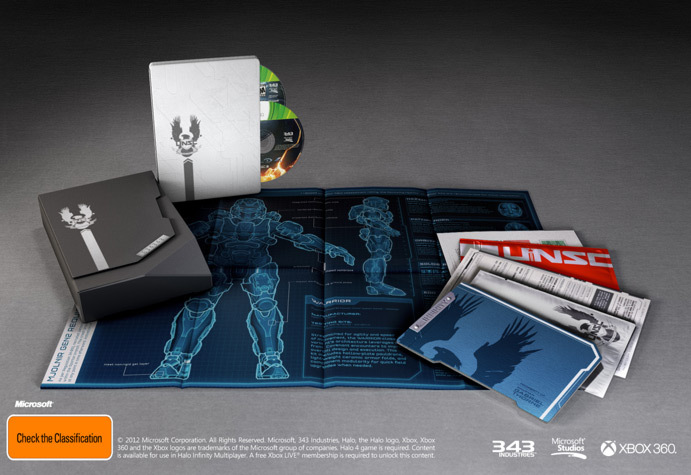 This Halo 4 edition comes with all its goodies packed into a stylish cardboard box. Unfortunately, this box wasn’t sturdy enough to avoid being crushed in the mail! This is a far cry from the tough container that came with the Halo Reach Limited Edition. Oh well, at least the box is quite big, surely I’ll get my $100 worth inside. Obviously the game, Halo 4, is there inside a white metal case. $60 value right there. The next thing I pull out is some sort of poster. The poster material is of very fine quality, it feels more like leather than cheap paper. However, it is the contents of the poster that is disappointing: an anatomy of a Spartan’s armor. Er… I’m a big Halo geek, but something this boring is about as likely to hang on my wall as the Periodic Table. Next we have the included DLC. I was actually hesitant to buy this limited edition until I watched part of the "Halo: Forward Unto Dawn" Youtube series. What I watched was excellent and so good I was willing to wait for my digital copy within this Halo 4: LE. Okay, I have numerous problems with the version of Forward Unto Dawn that comes with this package. First I don’t get a downloadable copy, but instead a special edition that I can only watch on Halo Waypoint. Wow, thanks. Not only do I need an internet connection to watch this, but I also need XBL Gold. Thanks Microsoft for forcing your nonsense “XBL Gold Required” policy on this. More DLC is the three War Games map packs. A $25 value… although none of the packs are available yet. I suppose some of my playtime of the game goes into this. I like the multiplayer of Halo 4, but I don’t think I like it as much as Reach. I have my doubts that I will still care about these maps when they come out. Regardless, it is good item for extras that so far have been a waste of space. The rest of the DLC are lame in-game items that honestly are not even worth listing here, little own mentioning. There’s also an included military briefing package which contains a bunch of geeky Halo military info. It is nice, but I got more than enough of this with the Reach: LE (which I never finished reading). "But Kevin!" you say, "At least you got a cool metal case for your Halo 4 game!" Not so fast! Although it is kind of nice, it looks nowhere near as nice as my Blu-Ray steelboxes, and it seems prone to scratching. Also, it does not look well with my other Halo copies in my collection. This will likely be the last Halo LE I buy. For the record, the game is pretty good from what I’ve played. At least, it is better than I thought from a developer that is not Bungie. Too bad I can’t help but feel ripped off from the rest of the package.